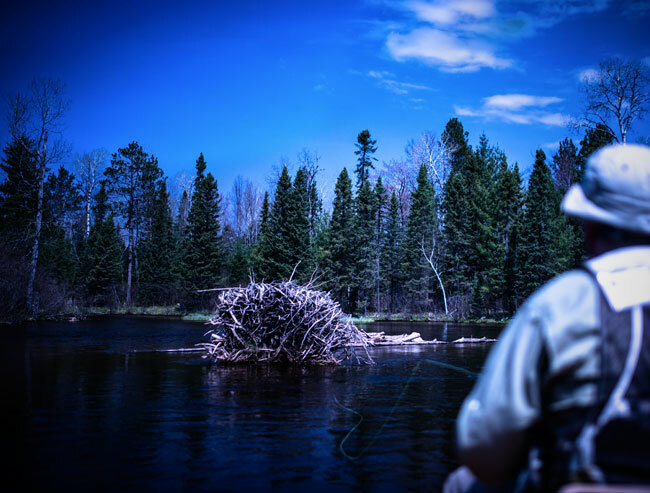 Last week I had the pleasure of fishing the North Branch of the Au Sable with the head guide of Fuller’s North Branch Outfitters, Chris Lessway. The Au Sable is a special river. I won’t go as far as say that the community of Au Sable anglers in the late 1800s invented fly fishing for trout on this continent, but they sure did a lot to advance the cause. Poling along in an historic Au Sable riverboat, our conversation turned to the hot nights not too far in the offing, and the season of night fishing the evening heat heralded, first with brown drakes, then with hex, then mousing straight on thru till early October. In Michigan, brown drakes mean setting up near log-jammed holes, fishing the heaviest tippet you can get away with (usually 4x for a size 10 fly pattern), and being prepared for truly big fish. Spinnerfalls—more predictable an occurrence than the emergence of duns—happen in the last light of evening on warmer nights; you’ll see the spindly silhouettes of the bugs swooning against the twilit sky. Brown drakes may show up as early as May in some parts of the Midwest and as late as July in the Rockies. Like their larger relative hexagania limbata, brown drake nymphs are burrowers. They will often be found in similar environments—silty, slower stretches—though brown drakes will also be found in slightly faster gradients characterized by sand and small gravel. On the Au Sable system, for instance, the swift, sandy North Branch doesn’t get any hex but does experience phenomenal brown drake action. As with many other emergences, the first night of good bugs might not result in good rise—or any, for that matter. It may take an hour or two of emergence activity for the fish to start to look up. In the meantime, they are likely feeding on nymphs poking out of their soft burrows in the slower water. Swinging and twitching a wet fly in the softer seams near shore, or upstream nymphing this water, will get you into fish that aren’t yet taking note of the smorgasbord on the surface. Once they do start looking up, it’s game on for anywhere from a few days to a few weeks, depending on the frequency of warm, humid evenings. At which time there are other contingencies, one being selectivity. Just because brown drakes are a larger mayfly doesn’t mean fish won’t scrutinize your offering. If you’ve fished brown drakes or hex, you know that larger fish, especially later in the hatch, can be surprisingly discriminatory. Chris’s advice is to carry a lot of different spinner patterns. And by different, we mean varying the thickness of the body, as well as the size and translucency of the wings (from thicker hair- and feather-wings to finer poly- and even cellophane-wings). If you get refusals from a fish you’re confident is feeding on spinners, try going with a slimmer profile. As with hex, it’s possible to have everything from emerges to duns to spinners on the water at the same time, with different fish in the same stretch keying on bugs at a different stage of emergence. The fish up by the bank may be eating cripples while the fish out by the logjam is taking duns. Remember you’re not “solving” a whole pod of fish at once, but solving individual fish one at a time. Be ready to cycle through the full gamut your imitations—emerger, dun, spinner, and cripple—when working a fussy fish. Much more so than in the daylight, the right gear makes night fishing both more enjoyable and more effective. Using the red-filtered light of your headlamp (and only when absolutely necessary) will help you save your night vision, even though during a spinner fall you might find yourself operating more by sound. Then there’s the quandary of presenting in the dark. And if you haven’t tried Rio’s Lumilux line (warning: it’s only produced in limited quantities and is not the easiest to find), it’s well worth the money to be able to see how your fly line is behaving in current. During heavy hatches the biggest of big fish like to hang out in eddies, and trying to dead drift through conflicting and reversing currents is nearly impossible when you can’t see your line. A glow-in-the-dark line will give you feedback on your drift that you would otherwise have to guess at. Whatever your poison—drakes, hex, mice, or all three—the season of warmer days and fishier nights is almost upon us. Take some time out of your daytime fishing to scout a few good slow-current holes, how to get there, how to get out, where to play a good fish. The payoff in a few week’s time could be the fish of the year.